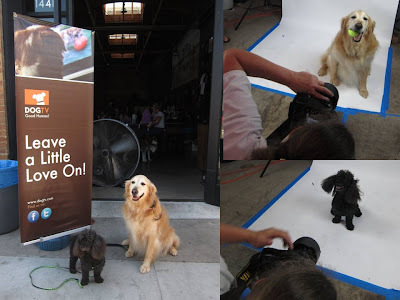 A few years ago , we became sponsors of dogs at Best Friends Animal Society. The other day, we got an email that one of my sponsees, Pinky Bear, is going to be adopted! We are all so happy. So I wanted to sponsor another. I decided on Hugo, a purebred Bloodhound. 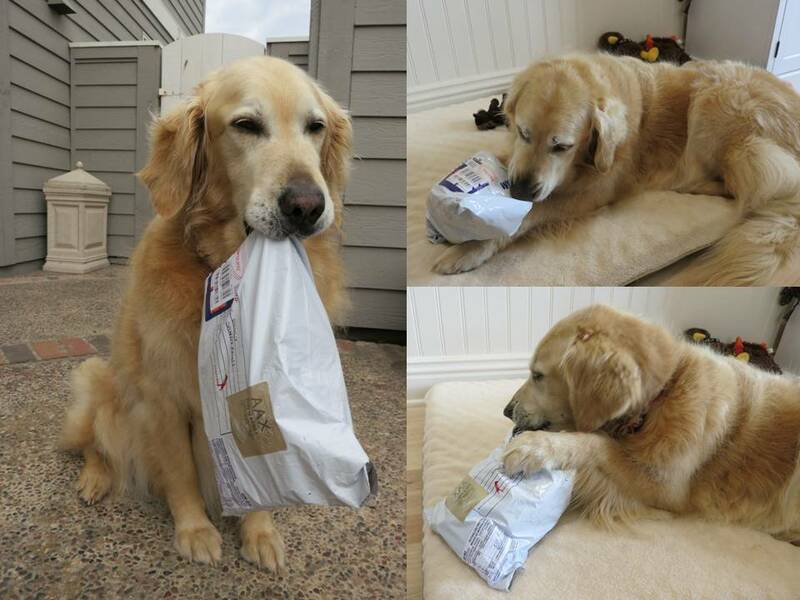 I figured he could be my very distant relative since Goldens have some Bloodhound DNA. Rosy also wanted to sponsor another dog so she chose Rueben because her middle name is Rue. I hope they get adopted real soon ! Maybe you would be interested? Rosy and I did the most exciting thing today, We went on a casting call for DOGTV ! I hope I did OK. Of course I had my ball with me. Rosy really hammed it up with adorableness and a big smile. 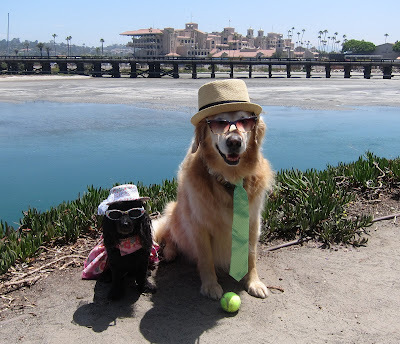 We are so hoping that DOGTV picks us. Wouldnt you watch if we were on? 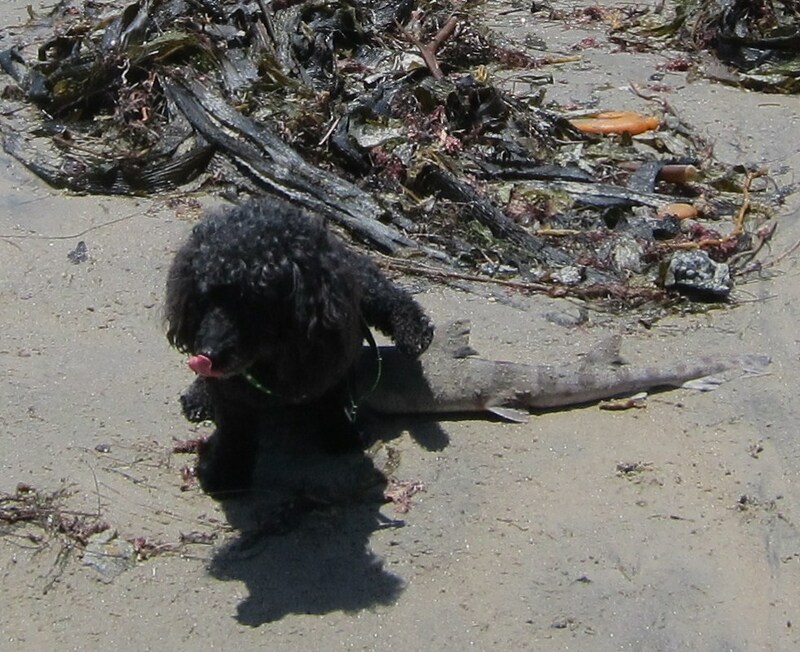 The other day on our beach walk we came across tons of seaweed. Rosy was excited cause she loves to smell and pee on seaweed. I told her she shouldnt pee on seaweed because Mom loves to eat Roasted Seaweed snacks from Trader Joes. I thought maybe this was a fresh shipment for Trader Joes. I wonder where they roast them? The Summer Olympics are so inspiring! 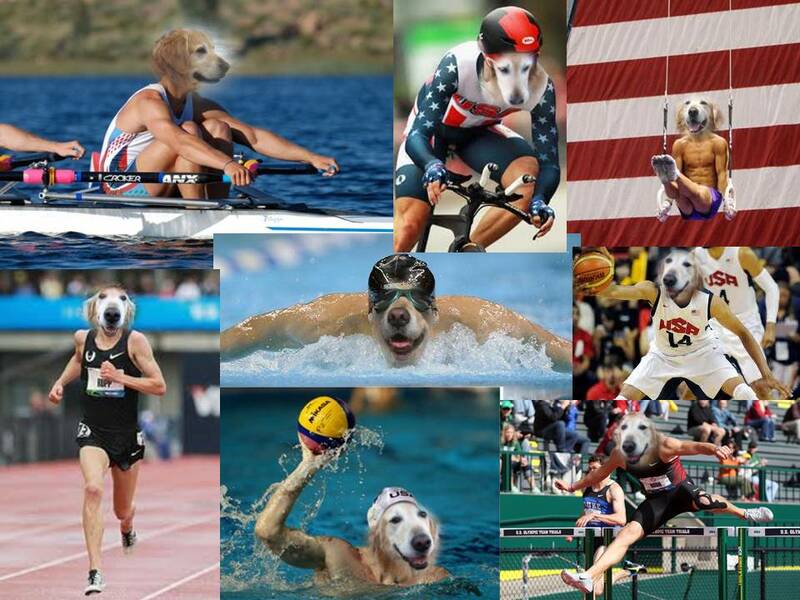 I greatly admire all the athletes. It gets me to thinking what it must be like to be an Olympian. But I cant decide what sport I could compete in. What do you think I would be good at ? ( I don't think tennis ball fetch qualifies). 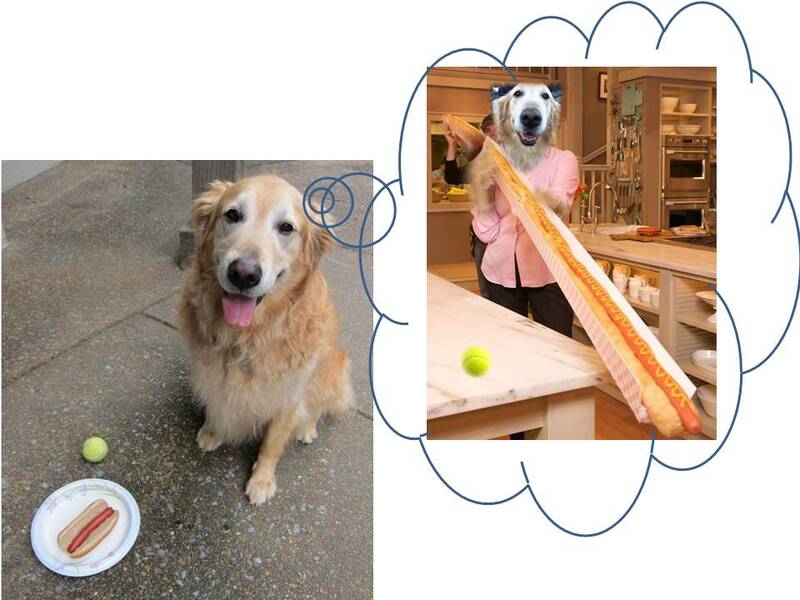 Today is Hot Dog Day. So I expect like last year, I will be served a hot dog. Now please don't get me wrong. I will be very grateful for that treat. However, I have been dreaming about Hot Dog Day and some how, a regular hot dog just doesn't seem appropriate for this special day. We love going to the beach to play and we are used to putting up with Mom taking pics. Last time Bunnybell came with us. She likes to tan and observe and she didn't mind the photoshoot.. However, after Mom took our pic, she thought it would be a good idea for Bunnybell to go swimming. Bunnybell was mad at Mom until later when we stopped at a cafe and Mom gave her chicken..
On Tuesday night Mom and Dad took Rosy and me to Dog Days of Summer at Petco Park. Before the game, we got to parade with lots of other dogs around the field. 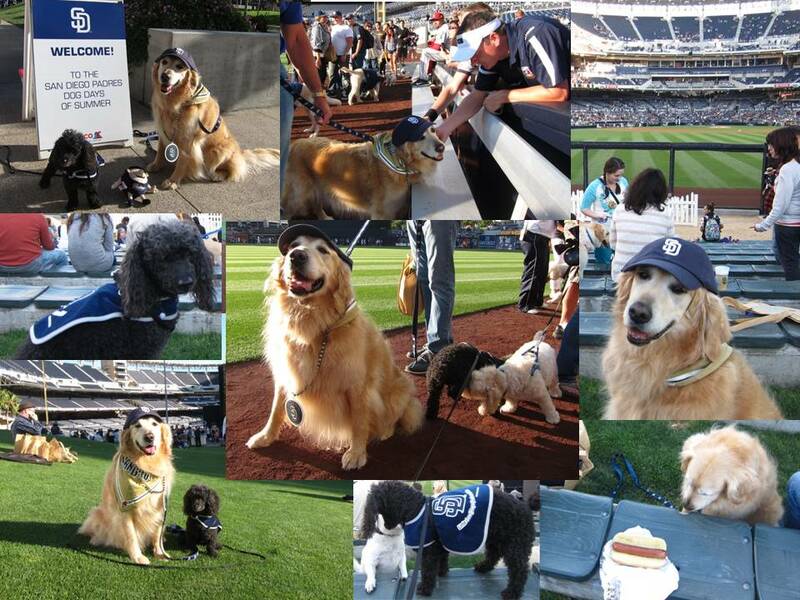 I loved when the fans called me over cause they wanted to pet me. This one a guy had a really big camera, so I went over to say hello and I ended up on the jumbotron! Cool! And the best dog I met was my hot dog! Congrats Padres on a great win ! Rosy and I wish that we could be among over 40,000 expected to attend Opening Day at Del Mar Racetrack. From what we understand it is one of the most fabulous, fashionable and fun festivities in the West. But of course, as canines we are not allowed to attend. However, we still intend to celebrate in style today. Mom brought home the August issue of Elle magazine and gave one to each of us. She told us to turn to page 142 and 143. Bunnybell and I opened ours and there was Sydne - my sis and Bunnybell's Mommy ! How exciting! Rosy first wanted to look at the magazine cover to check if there was any new information on the TomKat divorce. Rosy is so Hollywood. 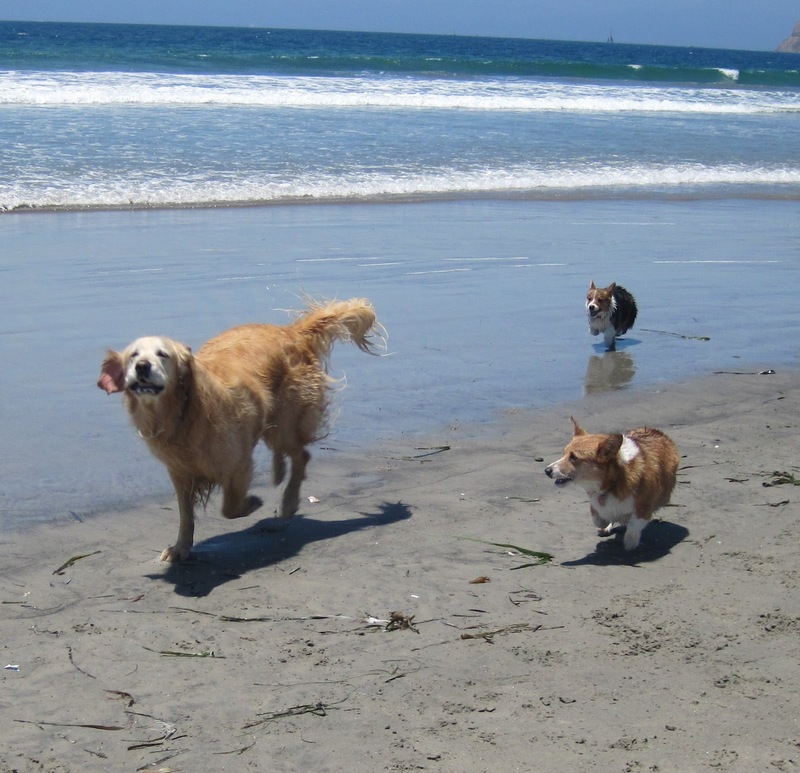 The other day when we went to the beach, I met two corgis. I thought they were very cute, but I was a little apprehensive to be friends since their names were Bonnie and Clyde. Well my instinct was right, they didn't try to shoot me, but they wouldn't stop herding me ! Ahhhhhhhh! 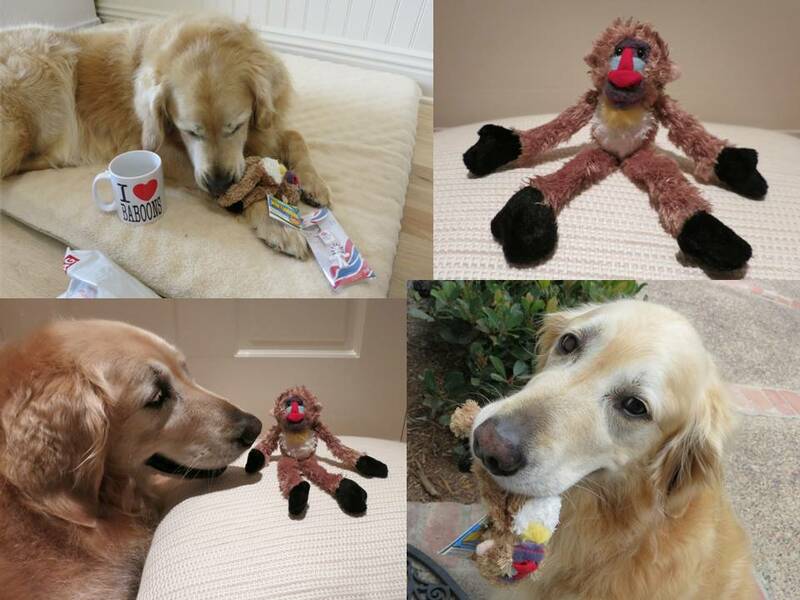 A few weeks ago my friend Kolo in England told me that I won his contest so he was sending me my very own baboon.Yesterday the mail lady came to the door and said she had a Royal Mail package for Bear . I was SO excited and couldnt wait to open it. Out came a cool Baboon mug, a fun London Olympics charm and then there was my baboon ! I loved him immediately. I will always take extra good care of him. When he grows up I will teach him to play with a tennis ball. I just havent decided on a name. Any ideas? Everytime after the beach, I have my bath. First, fresh water is sprayed on me so I get even wetter. 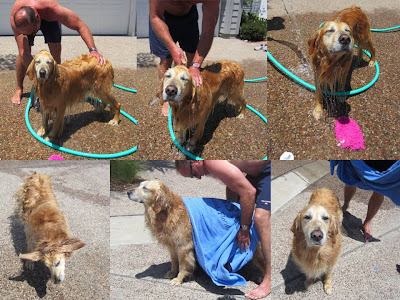 Then yum smelling shampoo is poured on my back and I get a massage. (I wish the massage glove was blue instead of pink). Then I go through the rinse cycle. After I am told to shake. Then I get a rub down. And then I am admired. I just love baths, don't you? 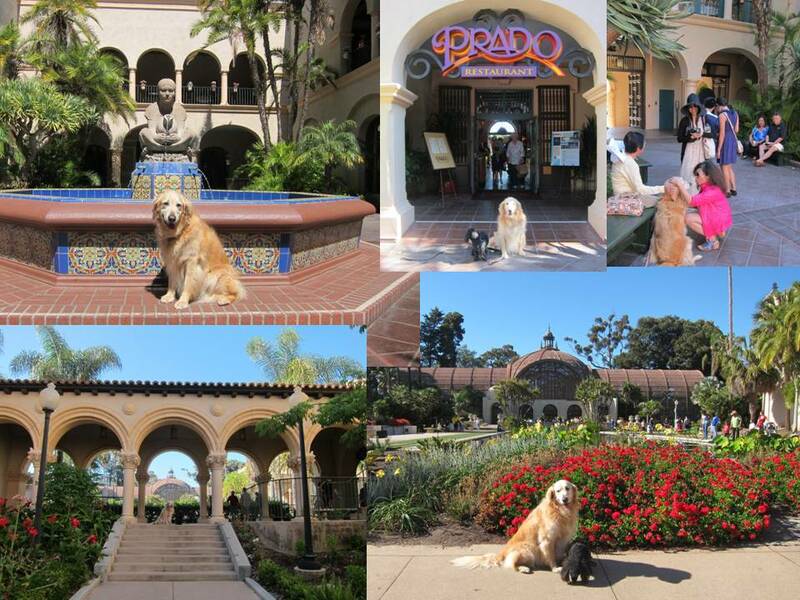 Here I am on Coronado Island in San Diego. Coronado was rated the best beach in the whole country ! While it is beautiful and the sand sparkles from the mineral mica in the sand, I think I know what put the beach on top. It has a fantastic year round off leash dog beach. 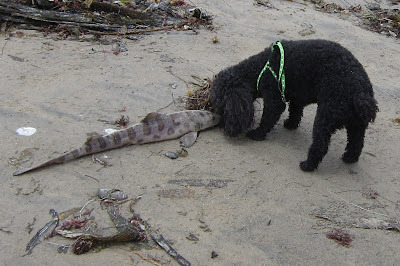 The other day Rosy found a shark on the beach. I told her we should report it to the lifeguard and that she should be careful, She said "I am not afraid of a shark.!" And she proceeded to pee on its head. The other day while walking on the river mouth path across from the County Fair, a giant bird flew right in front of me and landed in the shallow water and then stood totally still for a long time. Someone told me it was a Great Blue Heron. Then I read more about it. It stands motionless waiting for its prey. Oh. I thought was just being a good bird and posing for my Mom. Today is the Fourth of July. It is called Independence Day cause it is the anniversary of the Declaration of Independence from Great Britain in 1776. 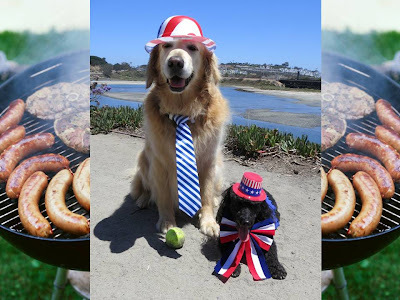 It is a well known day for barbecues. So Rosy and I have on our July Fourth attire and are waiting for an invitation. Will you invite us to your barbecue? 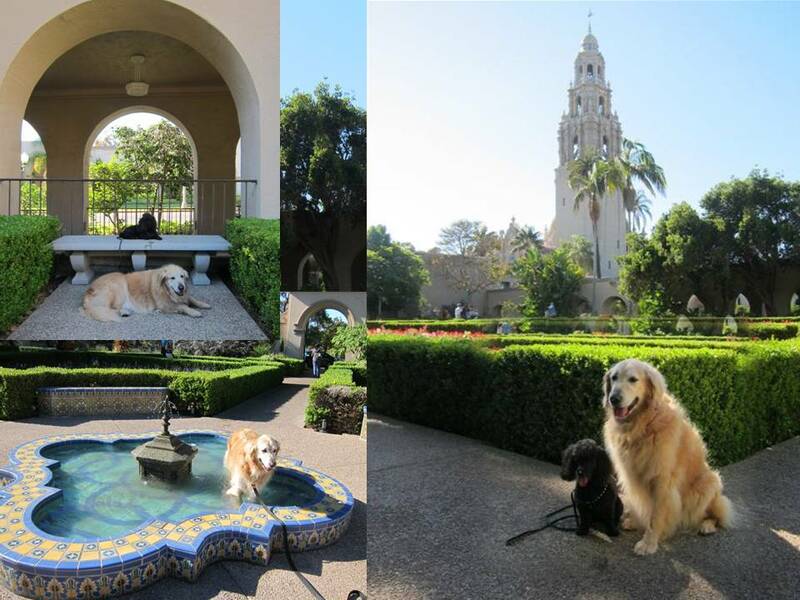 The other day we went to Balboa Park - a 1200 acre park in the middle of downtown San Diego. Its the largest urban cultural park in the United States --home to 15 major museums, renowned performing arts venues, beautiful gardens and the San Diego Zoo . So since we are not allowed inside the zoo nor the museums, Mom and Dad took us on a walking photo op tour. We all got to eat lunch at The Prado restaurant. Rosy and I had chicken quesadilla! Yummo! After lunch. there were these nice people from Hong Kong who wanted to pet me and take pics with me! I guess they thought I was part of the photo tour. 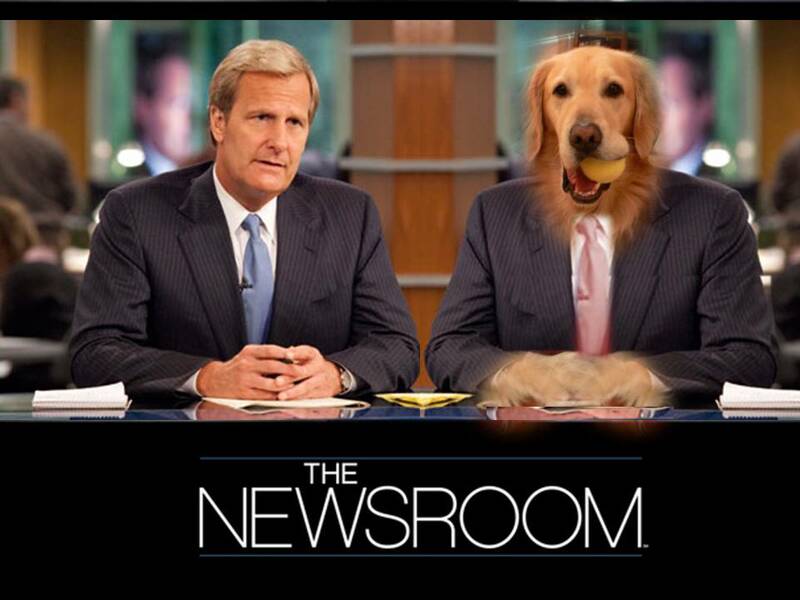 There is this new show on HBO called The Newsroom. I watched the season premiere and was very inspired. I guess I am already a journalist cause of my blog.But working in a newsroom seemed very exciting. Working as a producer seems interesting, but I think I would rather be in front of the camera. I wonder if they would consider me as a co-anchor?